As promised in the last post, here I am with a blogpost on the strawberries I grew some time back. 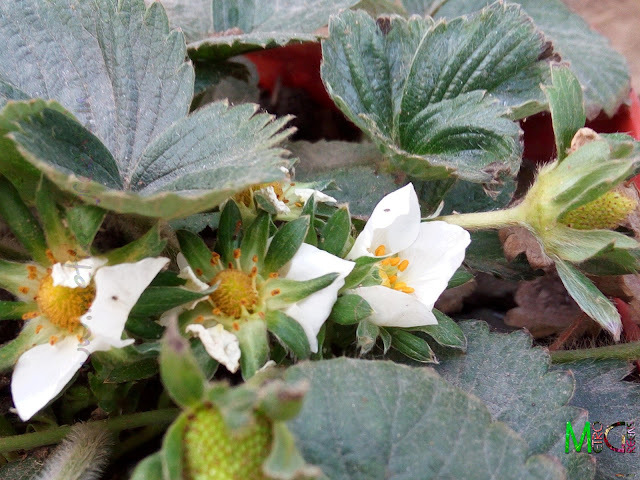 Though, as I already told you guys, the harvest was not a really great one, and the taste too appeared somewhat different from the strawberries I've had, with my harvest not being as sweet, and more of having a sour taste, even though it appeared to be blood red, and seemed ripe. 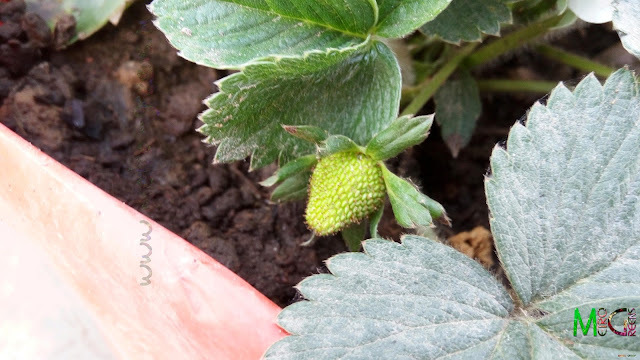 Though this was my second attempt at growing strawberries in pots, which, going by numerous pictures in various gardening groups on facebook appeared to be pretty easy task. Thus, I placed an order for some strawberry seeds from eBay, and sowed them. What happened after that was quite unexpected. There was no germination at all, leave alone having those juicy red strawberries right from my own garden. The second time, I happened to stumble upon these at a plants seller around my office where I used to frequent for my gardening supplies, as this one was quite equipped with almost everything I could ever need. And as soon as I saw these saplings, I knew these were strawberries, and bought some saplings home. Here I did my first mistakes planting strawberries in pots. The small pot I used for planting the saplings, thinking the physical characteristics of the plant will not need a big container, and lot of space too will not be required. But was I wrong? Yes I was. Though, the plant is small, the four saplings that I placed in the small pot became quite densely packed and this, I believe negatively affected the growth of them all. Apart from this, a fifth sapling that I planted in a bigger pot, alone, too didn't grow very well. A lesson well learnt, I guess. This I believe will be of great help when I go in doing this the third time, as I will be better prepared about the space requirements, sowing time, and other necessary information about its lifeline, and other important things that will be crucial for a better strawberry harvest the next time I set upon to grow these in my rooftop garden. For now, I will leave you with some remnants of the entire adventure that unfolded slowly over four-five months, and one that is still waiting to unfold itself completely with the last remaining two plants, two of the other three being dead after bearing some fruits, and a third one dying probably of loneliness of not being planted with one of its kind, though the expansive real estate it had got should ideally have it growing better than the rest. Ah! The final crop. 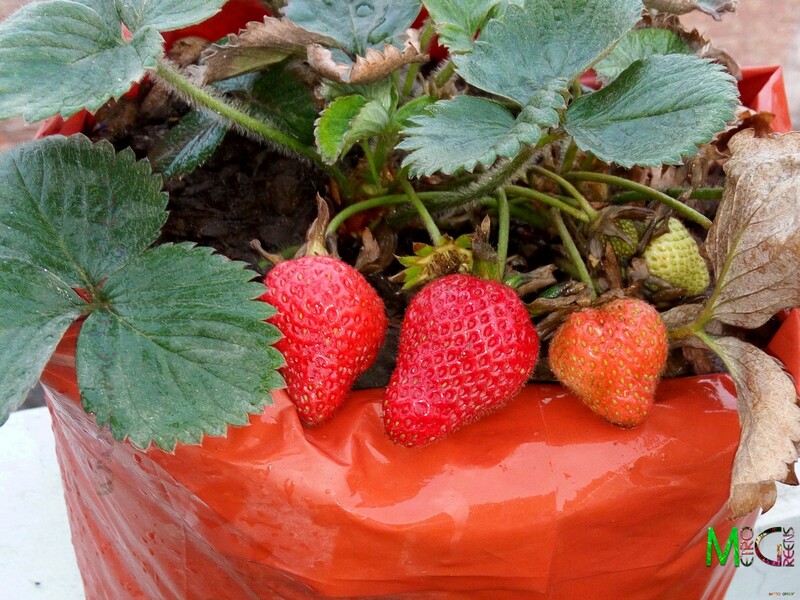 Delicious, juicy, red strawberries, fresh from your own garden. Huh! Strawberries are finally done! What next? Oh, didn't I tell you? There are grapes too, a few bunches, growing slowly, for some time now, with time that would force me to eagerly wait for a minimum of a month before I could relish those sweet-sour black round grapes, fresh from my garden. Who needs an orchard then? More on grapes, gerberas, moss roses and the wonderful crop of tuberoses, of which I have introduced a new variety, this year in my garden, and after a complete re-plantation of the previously planted bulbs, that is doing exceptionally well, in the bag, I replanted them this year, in the upcoming blogposts, in the coming weeks. Till then HAPPY GARDENING!